Protecting your vision is critical. In many situations, lost vision cannot be repaired. Yet, with preventative care and routine visits to the eye doctor, not only can you potentially see better, but you may be able to avoid vision loss or distortion. Everyone needs an eye exam from Eye Care Associates at least one time per year. For some, it may be more often. Maintaining a solid, long-term relationship with your eye doctor is important, and it doesn’t have to be challenging. Annual visits to Eye Care Associates are often considered the baseline. Those who have diagnosed eye conditions such as macular degeneration, chronic dry eyes and glaucoma may need to visit more frequently. However, routine eye appointments help to establish your long-term vision care and protection. We will then be able to monitor for changes in your eye structure and health as well as changes in your vision. When you come in for an eye exam at Eye Care Associates, Dr. Sami El Hage or Dr. Sylvie El Hage will gather a medical history from you and talk to you about the quality of your vision. They will then perform several screenings and tests on your eyes. The goal is to determine if the eye structure is healthy and look for any signs of conditions such as diabetic retinopathy, macular degeneration, or glaucoma. From there, a vision test is conducted. Here, Dr. Sami El Hage or Dr. Sylvie El Hage will ask you questions about the clarity and quality of your vision. If necessary, Dr. Sami El Hage or Dr. Sylvie El Hage will prescribe treatments for any conditions found. They may also write a prescription for contact lenses or glasses if your vision is deficient. 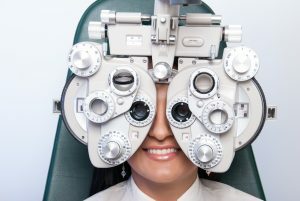 No component of the eye exam is invasive, painful, or even uncomfortable.